What are tags? | What are works? 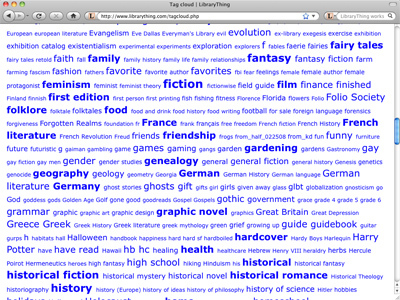 Tags are a simple way to categorize books according to how you think of them, not how some library official does. Anything can be a tag—just type words or phrases, separated by commas. Thus one person will tag the The DaVinci Code "novels" while another tags it "trashy, religion, mary," and still another only "summer home." Tags are particularly useful for searching and sorting—when you need a list of all your novels or all the books at the summer home. Once you have a hundred books or so, you need some way to organize them. Library subject classifications, including that of the Library of Congress, are one solution. For most personal libraries, however, they aren't much use. "Tags," informal, personal markers used on blogs and sites like Flickr and Del.icio.us, provide a better model. The LC catalogs Bean's Aegean Turkey, a guide to the archaeological sites of Turkey's western coast, under the single subject, "Ionia." For me, however, the book is about turkey and archaeology, tags I've applied to dozens of books, including Bean's other archaeological guides. The LC thinks Bernadette Brooten's Love between women: early Christian responses to female homoeroticism is about six different things, including the mouthful "Bible. N.T. Romans I, 18-32 — Criticism, interpretation, etc. — History — Early church, ca. 30-600." I get by with the tags early church, and homosexuality. To these I added the tag divination. Although the book doesn't say much about divination, its comments on the topic were actually the reason I picked it up. In addition to being a way to organize your own collection, social content sites like Flickr and Del.icio.us have shown that large numbers of different users' tags produce categorization structures ("folksonomies") that can surpass traditional taxonomies. (See Clay Shirky's talk "Ontology is Overrated: Categories, Links and Tags" for a stimulating discussion.) As LibraryThing grows, I expect to use this data in new and interesting ways. What is a book then? Formats. The unabridged audio book of Jane Austen's Sense and Sensibility is the same work as the paper copy.